Monster Hunter World (Steam) Update! 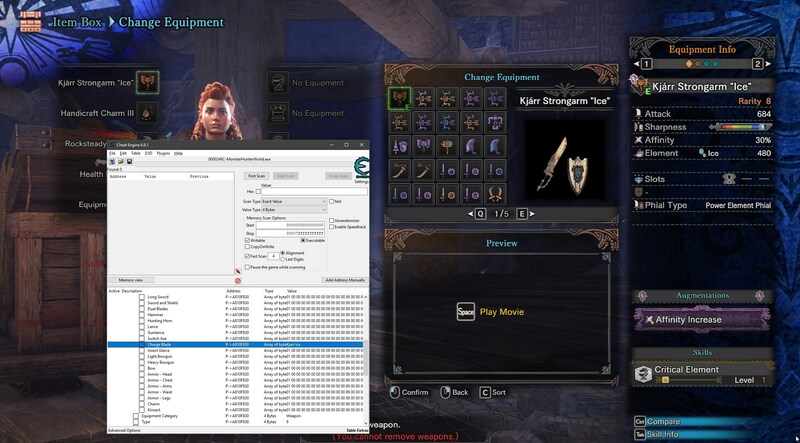 Fiddled around with the IDs before and now seem to have encountered the same issue with your table update, all the Kjarr weapons work except the Chargeblades. Why is it that they´re displayed as blanks (e.g. no name/ stat values) ? Looking at it, The Charge Blades should be fine, their IDs match the contents of the file entries. You're not going to see a name in the "Item" field because I didn't update it, and you should be using the item by category selectors, otherwise I don't see any issues with it. You have outdated nativepc files or are on an illegal copy without the data. Guys, can anyone confirm if i can still use the stealthedit2.4 ? or i should delete it and use the new Bypass ? I guess I'll have to check my nativePC again, I got my MHW on Steam so that can't be it. Thank you for the advice! Edit: Yeah, I confirm it's something with the mods, the armor was messed up too at first and, as soon as I removed the nativePC from the dir, everything showed up as intended. Thank you for this update! anyone know how to get ryu's armor? Anyone know how to reset monster sizes? Everytime i talk to the researcher and open up the log book containing the monster sizes it just crashes if i go to another page. I uh accidentally messed up, I activated the unlock all poogie costumes and now I'm actually missing the most recent ones such as the Sparkling Party. Any chance this toggle could be updated so I can re-unlock them? I saw a thread somewhere and i forgot where it is and it says that i should just set the sizes to something like 1.27(?) for it to be in the general gold crown size. Legit small gold crowns use values 88-90 for all monsters. Legit large gold crowns use 123-125 for all monsters, except for Pukei-Pukei, Tobi-Kadachi, Anjanath, Radobaan, Deviljho, and Uragaan. These 6 monsters have large gold crowns at 120-123 instead. Some event crowns might give you smaller/larger numbers, though. Is Go To Character Edit Screen still working? Does somebody know the item id of incandescent weapon from kulve at ? Sorry for the late reply busy IRL. Anyways if i change the sizes do you think my research book wont crash anymore if i flick to a page?